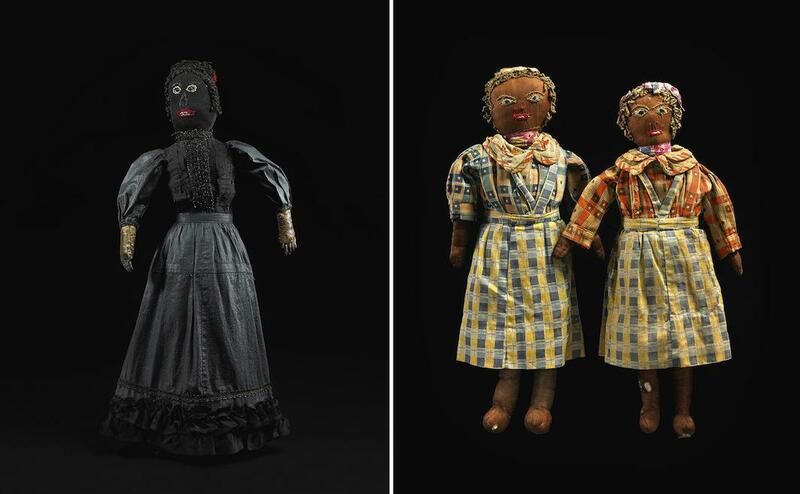 Ellen McDermott photographs Deborah Neff’s collection of black dolls in the book, Black Dolls. Left: Lady in Beaded Gown, Artist Unknown, United States, circa 1895. The black dress decorated with glass beads may be a mourning outfit, but her red shoes and the red bows in her hair are inconsistent with mourning attire. Right: Pair of Women in House Dresses, Artist Unknown, United States, circa 1920–30s. A pair of figures depicting well-to-do housewives in similar multi-patterned outfits. Before the 20th century, manufactured black dolls were virtually nonexistent. In the 1930s, they were still tough to find in major cities. For decades, if black American parents wanted their children to have black dolls, the only way was to make them. 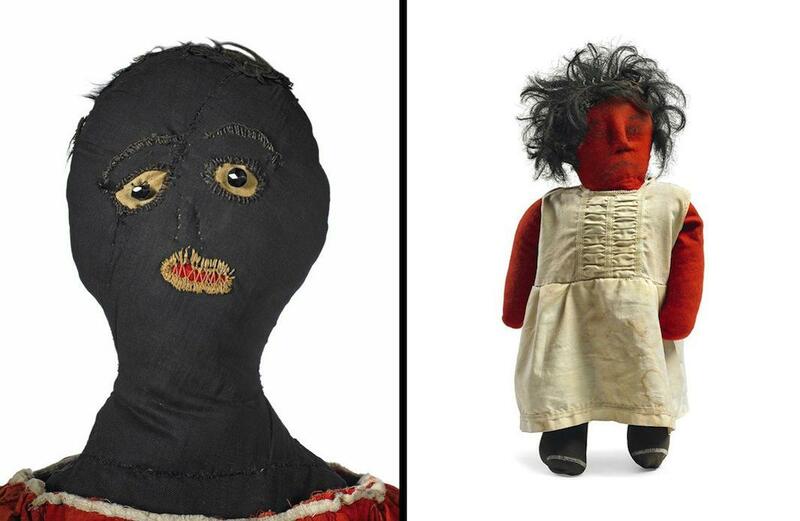 Today, these dolls are treasured examples of American folk art. Deborah Neff has been buying these dolls from flea markets, auctions, high-end antique shows, and dealers for decades. Her collection is the best in the world. The book Black Dolls, which was co-published in April by Radius Books and the Mingei International Museum, features Ellen McDermott’s photographs of more than 100 dolls from the collection. Left: Woman with Puzzled Expression, Artist Unknown, United States, late 19th century. This unusually large doll is wearing a modified child’s dress and manufactured children’s shoes. Right: Untitled (Red Doll), Nellie Mae Rowe, United States, Vinings, Georgia, circa 1970s. Black American self-taught artist Nellie Mae Rowe began making dolls when she was a child as playmates for herself in rural Fayette County, Georgia. Her early dolls were short-lived; Rowe fashioned them by tying up and penciling her own soiled clothing, just to dismantle them on washday and wear the clothing again. Neff already had an interest in handmade dolls before she bought her first black doll—a leather doll with shoe-button eyes, an embroidered mouth, and facial creases formed with bent nails—in the 1990s. “I sometimes imagine a saddler or boot maker creating him out of scraps at the end of a workday. He is not in the book—somewhat decrepit and not particularly photogenic—but I like him a lot. He’s a survivor,” she said via email. The earliest dolls in her collection date to the Civil War era. Besides two 1970s dolls from the self-taught artist Nellie Mae Rowe, Neff’s collection ends after 1940. “What happened after 1940? 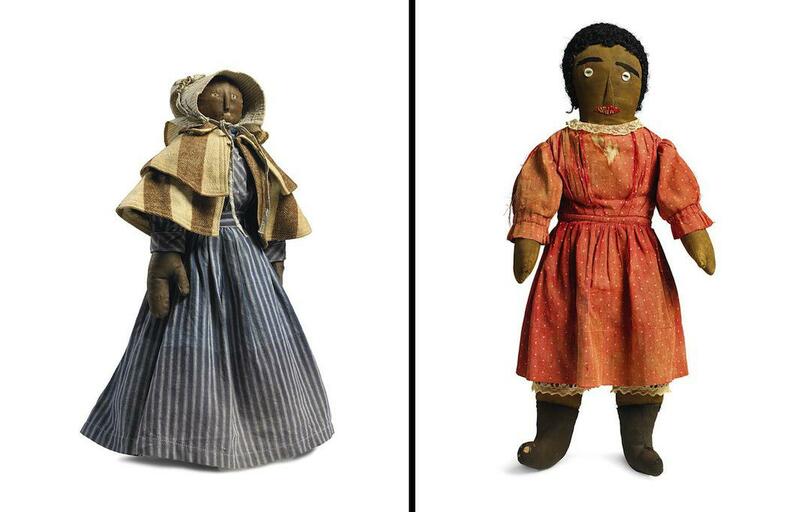 First, commercially manufactured black dolls became more widely available and affordable. Second, handmade dolls tended to be increasingly cute, and cute dolls don’t appeal to me. Third, the doll makers’ resourcefulness that does appeal to me tends to be absent from later handmade dolls,” she said. 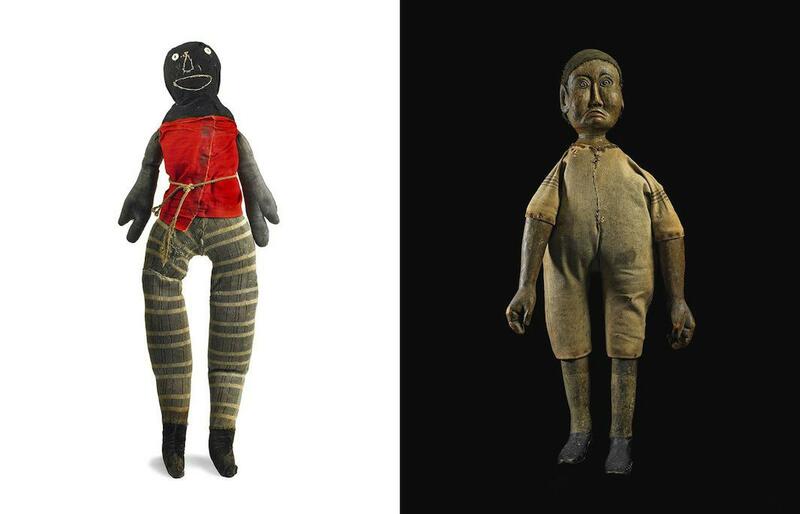 Left: Sock Doll With Red Shirt, Artist Unknown, United States, possibly Iowa, circa 1920s–30s. Attention is initially drawn to this doll’s unmistakably joyful smile. The shirt is a rectangular piece of cotton wrapped around the torso, held in place with glue and string and decorated with painted “buttons.” Right: Man with Pronounced Frown, Artist Unknown, United States, circa 1865–75. The deeply carved face of this unusually large doll bears visual similarities to Northwest Coast carvings, suggesting cross-cultural influences. With the exception of the Rowe and Leo Moss, the makers of the dolls in the book are anonymous. As a result, Neff can’t say with certainty that black Americans made them though she and the book’s editor, who is an expert in American vernacular art, believe that is the case. In her research, Neff couldn’t find any photos of black children playing with black dolls. She did, however, find photos of white children playing with black dolls. “This is perhaps not all that surprising given the presence of African-American servants in many white homes at the time and the deep attachments children tend to develop to their caregivers. How common it was for white children to play with black dolls, I don’t know. 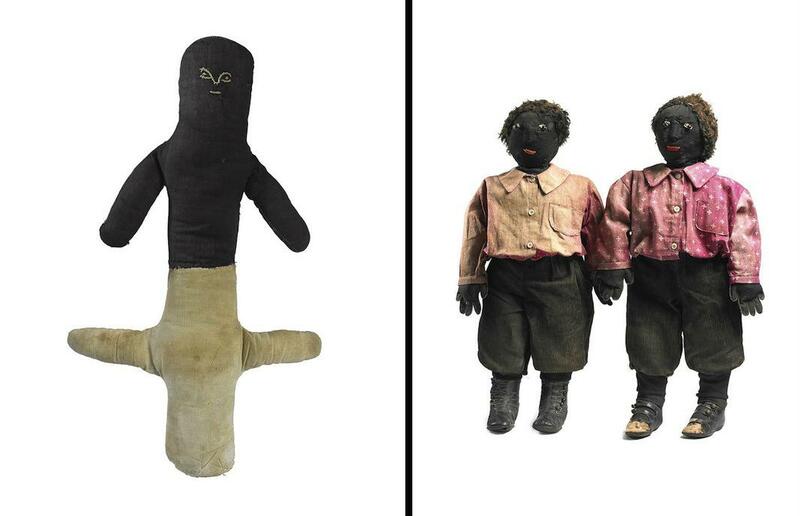 Were the dolls in my collection played with ‘mostly’ by African-American children? Unfortunately, I can only say I wish I knew,” she said. Left: Minimal Topsy-Turvy, Artist Unknown, United States, circa 1920–30. Topsy-turvy dolls evince the maker’s consciousness of living in a multi-racial society. It has not been established whether they were typically made by white or black Americans, whether they originated in the North or the South, or how they were intended to be used. This example, which was apparently never clothed, is noteworthy for its minimalism. Right: Brothers, Artist Unknown, United States, found in New Hampshire, circa 1895–1915. A pair of mischievous-looking boys wearing similar red print shirts, britches made from early corduroy, and manufactured children’s shoes. While some questions about the dolls may never be definitively answered, one thing that Neff can be sure of is that their makers were resourceful. To stuff them, they used whatever materials were on hand, including rags, straw, sawdust, raw wool, cotton, cork, and pieces of twisted metal. The heads and outer bodies are made of socks, stockings, wood, and coconut shells among other items. A few dolls are constructed over manufactured white doll bodies. Left: Woman with Striped Cape, Artist Unknown, United States, circa 1890–1905. Large so-called “lobster claw” hands are fairly common in 19th-century black dolls; in this case they are coupled with delicate facial features. The striped cape, which matches a hidden petticoat, was probably made from a Southern workman’s blanket. Right: Girl with Pigtails, Artist Unknown, United States, early 20th century. A young girl with prominent eyebrows, a long triangular nose, an appliqued mouth, and braided pigtails with original silk bows.